I can just imagine some of my friends being embarrassed for me after the day I had yesterday. Which reminds me. One of the questions in our Table Topics game is “What would you find more embarrassing? a) Seeing that your fly was down B) Finding out you had toilet tissue stuck to your shoe c) Discovering you have spinach stuck in your teeth.” The girls, Stephen, and I all agreed the spinach offensive would be the most mortifying. Over supper we use the Table Topics to generate some interesting conversations. My family used to discuss what random act of kindness we each had performed, but lately we are trudging through our days without being randomly kind. So either we need to step it up in that department or we need to just be happy talking about the Table Topics. My day was one from hell. Actually it could have been worse. The voiceinmyhead remembers worse days. I had not slept well the night before. The Time change on Saturday was still messing with me. Daylight saving time and “Spring Forward” was killing me. To top it off, I had had one too many glasses of wine. That never happens to me. No kidding. I have a pretty high tolerance or I did before Lent. I live in darn Savannah. We drink in this town. But you see, if you give up alcohol for Lent and then have a glass on two on Sunday (because Sunday is not an official day of Lent), so you can have the item you gave up…well that one glass will knock you silly and then when you have another it will make you forget that you had a glass already. By the time you have finished the 3rd glass, it is all over and the next day is ugly. Sad and ugly. So I sit at lunch with Carolyn and admit it. I am more head-achy and hung over than I have been in years and it is all because I gave up wine for Lent and then over indulged last night. Isn’t that sad? Not really. Wait. It gets worse. So I am sitting there and all of sudden my skin starts to feel like it is buzzing. My scalp starts tingling and the soles of my feet start burning up. Uh-oh. Oh crap. What in the world? Then “bam” the memories of what this is all about start to hit me. A darn Anxiety attack. No. It can not be. I have not had an anxiety attack in ages. There is no way to gracefully panic. There is no way to elegantly pass out. There is no way to stylishly puke. Luckily I was just being Erica at lunch and NOT Queen Erica. Queens keep a stiff upper lip and do not fall apart. 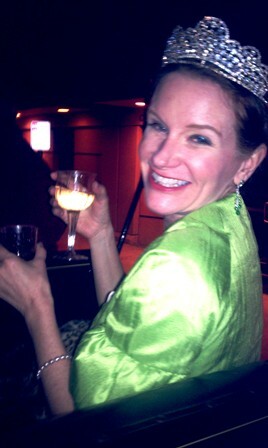 It would have been worse if you had been in green gown and tiara. There is no way to not call attention to oneself when you have trouble standing up because the room is spinning and the adrenaline that is normal when you are in a fight or fright-life threatening situation is now pumping thought your veins and causing you to have all sorts of strange physical reactions that don’t stop. Normally Carolyn is a walking medicine cabinet. She sells real estate for a living, but in another life she was a pharmacist, I believe. Or maybe a dealer. “Do you have a Xanax?” I ask, praying that she does. “No. I am sorry. You will be fine. What can I do?” She tries to comfort me. “I have some at home. I need to get home.” I can’t even see. That is an exaggeration. I can see, but everything is blurry. Ok, fine. But you can see. And you can stop this if you just concentrate. Focus. The voiceinmyhead is really annoyed with me. I am trying to focus. So I stumble up and she has to support me. I make it to the steps and put my head between my knees. It reminds me of the last time I almost passed out. The mammographer was showing me the small metal chip that the radiologist had inserted with a large needle into the lump I had found in my breast. I was standing there calmly and then suddenly the room was spinning and I almost hit the floor. It was April 30, 2010 and I had just had a needle biopsy. Ginger, the R.N in charge fanned me as I lay on the examine table. She told me about her vacation plans to go to Thailand and ride elephants. It helped get my mind off the fear and it gave her something to do besides take my blood pressure every few minutes. So as I sat trembling and shaking on the steps of Johnny Harris, all I could think was how ridiculous it was that I could not control this random reaction. Carolyn helped me get into the car. It felt like I was having a stroke, but I wasn’t. That’s just what anxiety attacks feel like. So when it was all over, normally I would feel a tad bit embarrassed that I had caused a little scene. Having a friend have to almost carry me out and all that mess. That kind of embarrassment, you know? But today, at this point in my life, I am not embarrassed. I am proud to be who am. Imperfections and all. But given a choice, I would much rather have had spinach stuck in my teeth or had problems with my zipper.